As of June 28, 2012 a total of 5,684 cases were closed under a special Immigration and Customs Enforcement (ICE) program announced in August 2011. The stated goal of the program is to reduce the massive backlog of pending matters in the Immigration Courts by identifying those that could be dismissed or put on hold through the exercise of prosecutorial discretion (PD). The number of PD closures was up from 4,585 cases closed as of the end of May; however, it still amounted to only 1.9 percent of the 298,173 cases that had been pending before the Immigration Courts as of the end of last September. The monthly pace of closures is shown in Figure 1 and Table 1. The upward trend in the rate of closures is evident. PD closures rose steadily between December 2011 and March 2012, dipped slightly in April and rose again in May when the rate of monthly PD closures reached 1,138. The June total of 1,103 was very close to this peak volume. While overall PD closures to date have been much lower than what the Administration originally had led the immigration community to expect, the cumulative count keeps rising and there is yet no sign of any real drop off in day-to-day closures. PD closures generally have involved cases that have been waiting longer than other types of closures. On average, it took 803 days between the date charges had been filed in Immigration Court and when the PD closure finally took place. This is in contrast to 385 days on average that Immigration Court closures have been taking this fiscal year. PD closures even take longer than the average time for Immigration Judges to grant relief — cases that typically take longer than any other type. 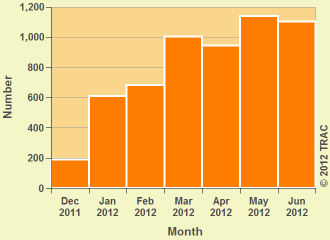 During FY 2012, for example, relief was granted on average in 773 days. These and other results are based upon analyses of very recent case-by-case records obtained from the Executive Office for Immigration Review (EOIR) under the Freedom of Information Act (FOIA) by the Transactional Records Access Clearinghouse (TRAC) at Syracuse University. EOIR, a part of the Department of Justice, administers the nation's special administrative court system charged with deciding whether noncitizens can be deported or are legally entitled to remain in this country. Immigration Court records also indicate that only 294 of the 5,684 closures, or 5 percent, were for individuals who were not represented. In the remaining 95 percent the individual had an attorney. As might be expected, immigration violators dominate PD closures compared with other types of court closures. In only 72 cases (less than 2 percent) had ICE charged that the individual had been engaged in criminal activity as the basis for seeking a removal order. There were no PD closures of anyone who had been charged with terrorism or being a national security risk. This compares with 8.3 percent of the pending backlog as of September 2011 in which ICE sought removal action on the basis of individuals charged with criminal activities, or actions adverse to national security, or aiding terrorism. For 64 percent of PD closures, the most serious violation charged as the basis for ICE seeking a removal order was entry without inspection. In an additional 34 percent some other immigration violation was charged. Some nationality groups appear to be offered and agreeing to PD closures more often than other nationalities. Table 2 compares the twenty nationalities with the largest numbers of PD closures to date with their backlog of pending Immigration Court cases as of September 2011. The largest number of PD closures for any country was 3,060 for Mexico, representing 2.9 percent of the backlog for this country, a closure rate higher than the national average of 1.9 percent. South Korea had the highest PD closure rate of 3.9 percent, followed by Cameroon with 3.6 percent. Two countries stood out for especially low numbers offered and agreeing to PD closures. China was at the bottom with 0.2 percent, or only 63 out of its backlog of 26,579. India was next lowest with 0.8 percent, or only 57 out of its backlog of 7,432 cases pending before the Immigration Courts. The Los Angeles Immigration Court continues to lead the country with the largest number of closures under this program — 707, up from 534 at the end of May. The Denver Immigration Court was again second with 546, up from 401 at the end of May. In third place was the San Francisco Immigration Court, now 487 as compared with 387 in May. 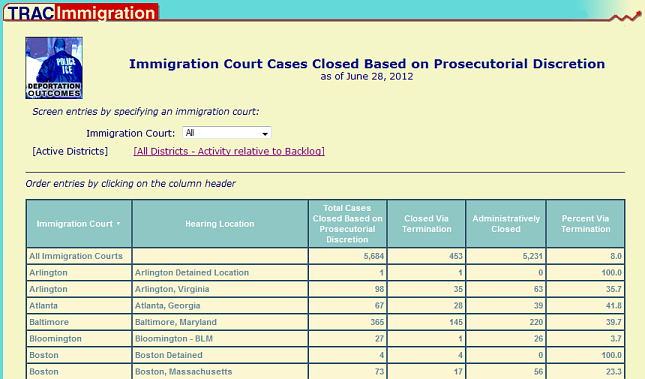 TRAC's Immigration Court Closures Tool provides a detailed look at the cases for each court and hearing location. The tool also provides prosecutorial discretion closures by type, as well as compared with each court's pending caseload.